Show off your favorite spring styles and stay protected from Mother Nature’s chillier mornings in our these lightweight outerwear picks. The arrival of spring means it’s time to ditch the heavy layers and break out those brightly colored, happy styles to welcome the season. But Mother Nature is not quite ready for us to retire all of our outerwear, as we still need protection from chilly mornings and nippy evenings. The solution for transitioning? Opt for light jackets that don’t take away from the springy styles underneath. 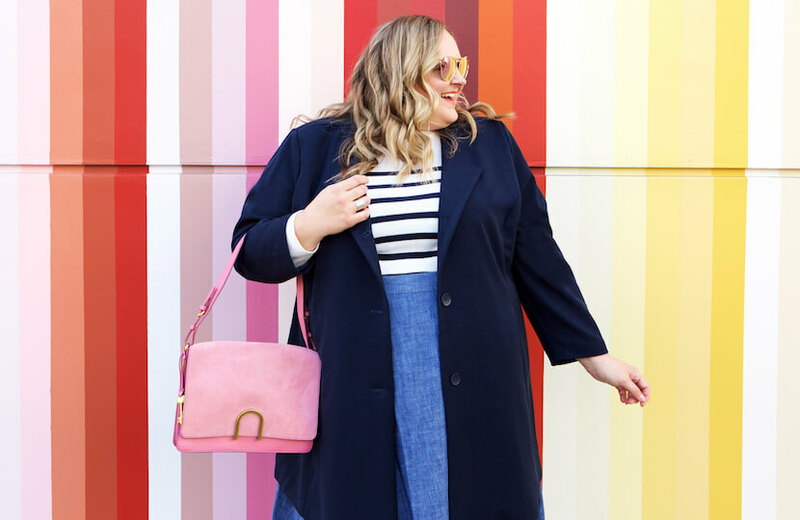 Get spring outerwear inspiration with 4 of our favorite looks of the season, courtesy Reah Norman. Upgrade your trusty denim jacket for a clean white version. White always feels fresh and pairs beautifully with just about anything in your spring wardrobe, making a white denim jacket the perfect easy layer for the season. A chilly morning and breezy evening? 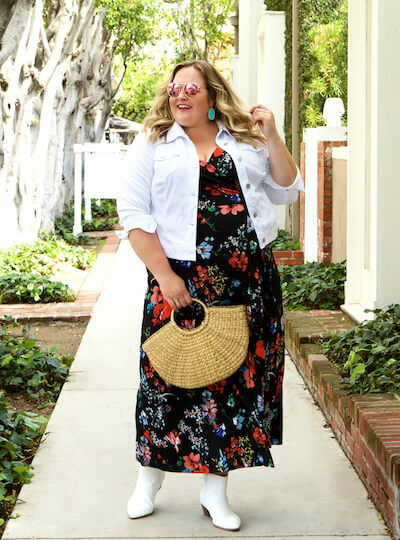 A lightweight jacket that complements your favorite spring dress is in order! A car coat in navy is the quintessential wardrobe staple to bring out for this time of year. 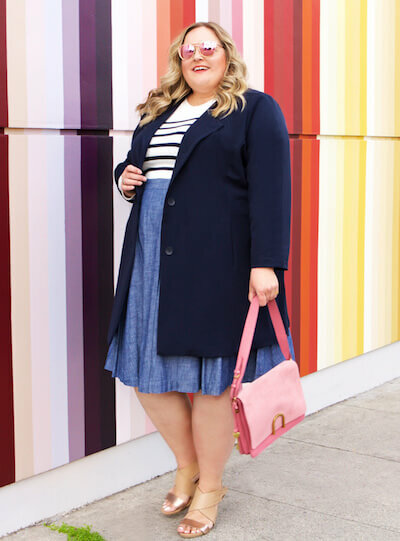 Navy can feel a bit more chic and sophisticated than black, and it makes for a gorgeous canvas against bold pops of spring colors like bubblegum pink. We love how animal prints and other bold prints turn heads. 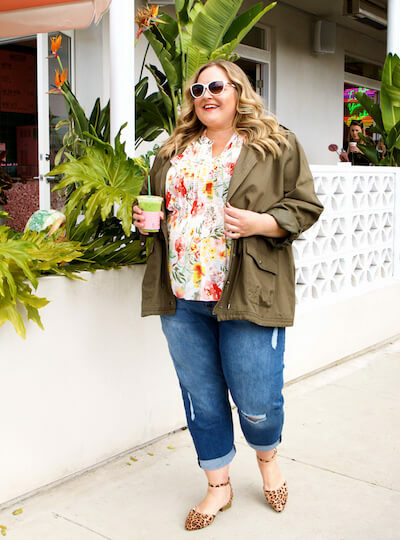 Balance out any bold printed dress with a tried-and-true staple like an easy denim jacket in a medium wash.
A feminine floral print finds balance when paired with borrowed-from-the-boys pieces like a cargo jacket and boyfriend jeans. Not only are cargo jackets super practical with their spacious pockets, but they can zip up with ease and provide protection from a chill in the air or a surprise rainstorm. What’s your go-to light layer for spring? Show us on social with #mydiastyle and be sure to let your Dia Stylist know if you’d like a new light jacket to help you transition through the seasons.